Built by Harland & Wolff of Belfast for Union-Castle's mail service to South Africa, Edinburgh Castle was launched in January 1910. She made her maiden voyage in May of that year, arriving in Cape Town for the first time on 7 June. En route from Cape Town to Southampton when World War I began, Edinburgh Castle was diverted to Gibraltar to embark the British garrison stationed there, and was escorted home by H.M.S. Minerva. She was then requisitioned as an auxiliary cruiser, and as various times during the war she patrolled the South Atlantic and served in North Atlantic convoys. 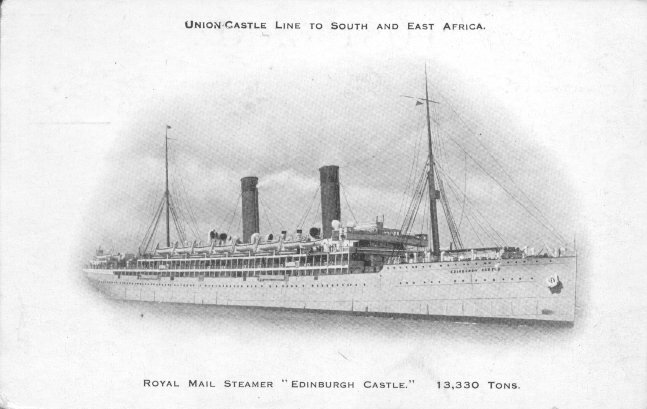 She returned to Union-Castle's commercial service in July 1919. In 1938, Edinburgh Castle was withdrawn from service and laid up at Netley. In August 1939 she was requisitioned by the Admiralty to prevent her being scrapped. In January 1940, she was purchased by the Admiralty and stationed at Freetown, Sierra Leone, as an accommodation ship for sailors and survivors of sunken ships. She was one of a relatively small number of merchant vessels to serve in both world wars. She was released from service in September 1945, but by then so much growth had accumulated on her hull during her years at Freetown that she could not be economically returned to Britain for refitting. So, towed 60 miles out to sea, she was sunk by the Royal Navy in a target practice exercise.